Mobile is no longer on the sidelines. 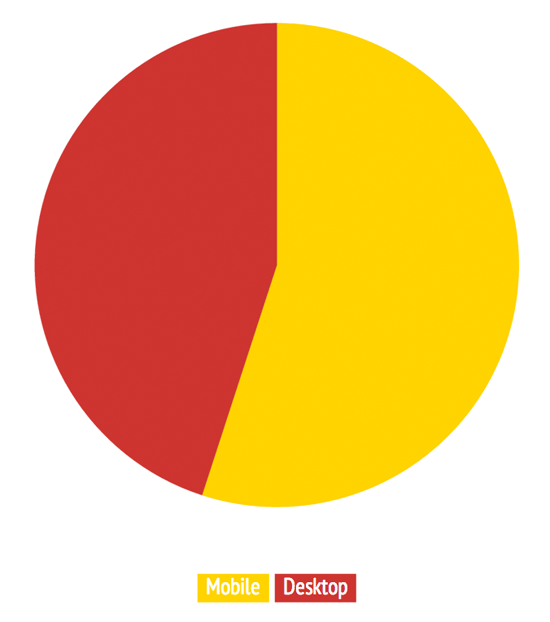 If you’re not already thinking mobile first, you should at least consider it. Let’s go over compelling data that demonstrate the importance of focusing on performance for mobile devices. Here are some figures showing the rapid growth of business on the mobile web. This number comes from research by comScore for Shop.org1, released last fall. 44% of the time people spend on retail sites are on smartphones, and 11% on tablets. This finding correlates to a statistic that was shared by UK-based online shoe retailer Schuh.com: Every month, 1% of their desktop traffic converts to mobile traffic2. Between 2011 and 2013, mobile revenues in the US more than tripled. 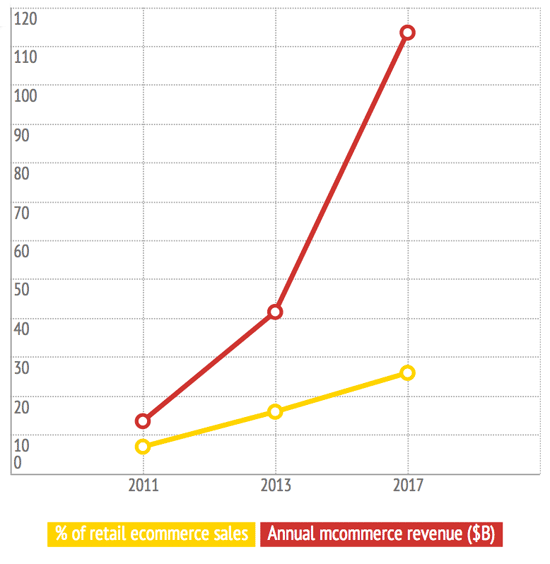 In 2013, mobile generated 16% of total ecommerce sales. By 2017, that number will increase to 26%.3 Think 26% sounds insignificant? It’s not — unless you think $113 billion is a trifling amount of revenue. At the end of last year, the conversion rate for smartphone users was about a third the rate for desktop users. Tablets, however, are catching up: at 2.59%, the conversion rate for tablets in the last quarter of 2013 had surpassed first quarter 2013 rate for desktop users. More findings from comScore: In their February 2014 market review, they found that 57% of consumers access a company’s site from both their PC and mobile devices before buying.4 This puts a great deal of pressure on ecommerce developers to ensure a consistent user experience across all platforms. 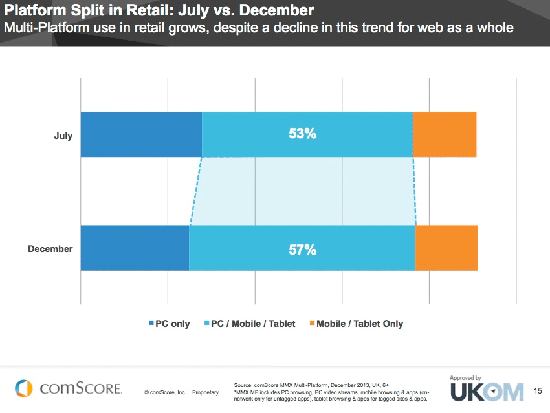 Looking at all the stats we’ve just covered, there’s a clear disconnect between how much time people spend on retail mobile sites (55%) and how much money they spend during that time (16%)5. There are a number of factors to explain the disconnect, but a critical one is page speed. Slow pages are the number one issue that mobile users complain about, ranking even higher than site crashes. I need to stop being surprised when I talk to people who assume that mobile users will settle for sluggish load times, because that’s just the way the mobile world spins. Those individuals couldn’t be more wrong: 85% of mobile users expect pages to load as fast as, or faster than, they load on the desktop. 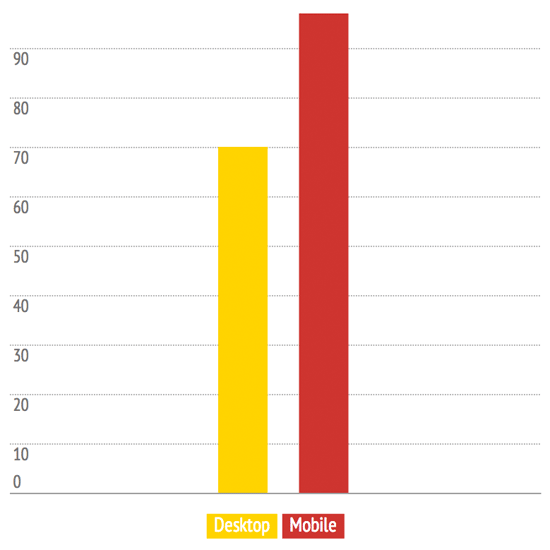 Mobile users are affected at a neurological level by even small changes in a site’s speed. Most users may expect wait times of 4 seconds or less, but our research8 shows that the majority of sites can’t deliver this kind of speed to mobile devices. Last fall, we measured the load times of the top 100 ecommerce sites — both the full-site version and the m-dot version — on a variety of smartphones and tablets. We found that even m-dot sites, which are intended to deliver a faster experience, generally failed to meet users’ 4-second wait-time threshold. 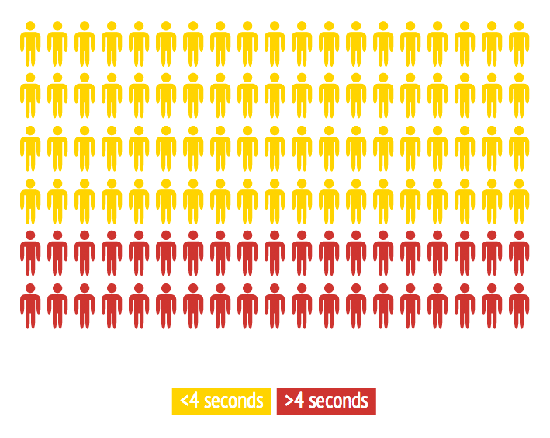 Only 2% of the full-site versions loaded within 4 seconds, with the median load time being almost 8 seconds. The disconnect between user expectations and the reality of the current state of mobile web performance has a measurable impact on the bottom line. Slow performance affects every business metric site owners care about, from shopping cart abandonment to brand perception. The abandonment rate for mobile shopping carts is 97%, compared to 70% for desktop carts.9 This tells us that people are using their carts on mobile, which is good, but then they’re ditching them, which is obviously bad. Slow performance is a critical factor, as is the pain of filling out long order forms. Even seemingly minor performance problems can have a major impact on mobile business metrics. A while back, we did a split test over the course of 12 weeks, in which we segmented mobile traffic to an ecommerce into four groups: a fully-optimized control group, plus three groups that were subjected to 200ms, 500ms, and 1000ms HTML delays. The 200ms delay yielded negligible results, but the negative impact was much stronger at 500ms and 1000ms. When their shopping experience goes wrong, not only do mobile consumers abandon their shopping carts, they also head to your competitors. When faced with a negative mobile shopping experience, up to 33% of mobile shoppers will go to a competitor’s site next. In the same study I cited earlier, we asked all the participants in our mobile EEG study for their impressions of the sites after the tests were done. We then fed all the descriptors in the interviews into a word cloud generator. Bear in mind that none of our test subjects were aware that they’d been involved in a study about page speed. They thought they were simply testing each site’s overall functionality. 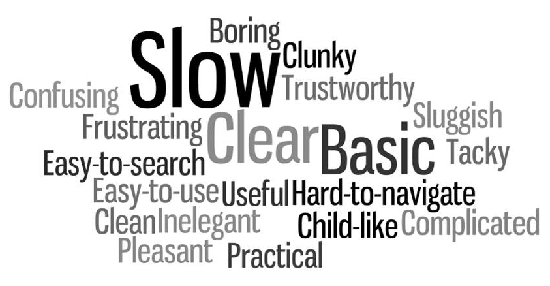 It’s fascinating to see that the word cloud for the slower site contains almost three times more negative adjectives than the faster site. While some participants clearly picked up on the slight deterioration in performance ("slow" and "sluggish"), participants also developed negative perceptions of areas that are unrelated to speed. Responsive web design is a great way to ensure that your pages have a consistent look across multiple platforms, but it’s not necessarily a great way to ensure that your pages are consistently fast across platforms. I recently tested the start render and load times of 60 pages that have been included on various "best of RWD" lists. Only 3 of them loaded in 4 seconds or less — on desktop no less — meaning that they’re likely to load even more slowly on mobile devices. One thing the fastest sites all had in common was the fact that they were all under 1 MB. In performance terms, latency is the amount of time it takes for the host server to receive and process a request for a page object. The amount of latency depends largely on how far away the user is from the server. 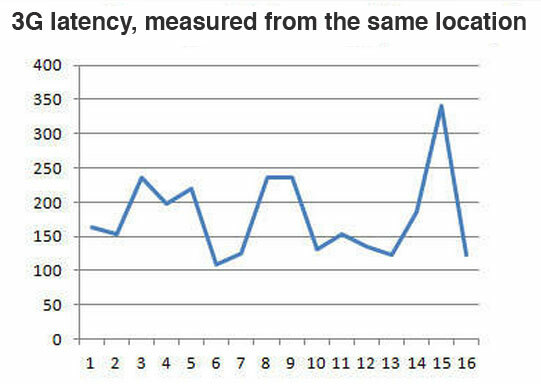 Mobile latency is consistent only in its inconsistency, even when measured at the same location. This is due to a number of variables beyond the amount of data passing through the tower. Factors such as the weather, and even the direction the user is facing, can have a significant impact. 3G latency can reach 350ms or more per page resource. And a typical page can easily contain 100 or more resources, so all this latency adds up fast. This is why Google performance expert Ilya Grigorik has stated12 that if you’re designing for mobile, it’s safe to assume you’re going to incur 2000ms of 3G latency. What can you do to give your mobile audience the user experience they demand? There are a number of techniques for optimizing mobile performance. Some of these techniques — such as compressing and consolidating resources — can help with both mobile and desktop issues. Others — such as leveraging localStorage as a workaround for smaller mobile browser caches — are specifically focused on improving the mobile experience. If you’re interested in taking a deeper dive into these techniques, check out this post I wrote for ACMQueue. If you’re curious to learn more about Tammy Evert’s theories on web performance and mobile, be sure to attend her sessions at O’Reilly’s Velocity Conferences this year. Velocity is, in my opinion, one of the conferences all developers should go to. A lot of data, best practices, and techniques related to web performance are born at this conference. Use code SIXREVISIONS20 when getting your ticket to save 20%.